Here's why I love the internet (well, sometimes). Got an email from a bloke in Brisbane, Australia who stumbled across the Runway blog about Ted Knight I wrote a couple of months ago. 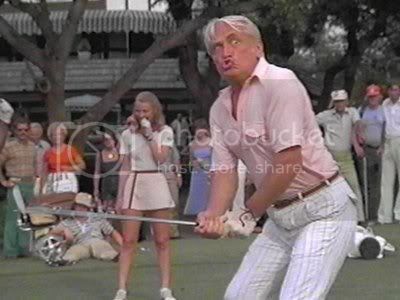 He and some Aussie pals, who all worship Caddyshack, started a Ted Knight Memorial "Gof" (that's golf without the 'L') Invitational back in 1986, the year Ted passed away. It's been held annually at various courses in The Land Down Under, and the lads recently completed their 22nd tournament in December. They even have their own rather extensive website, with full results and participants. Seems like they get their fair share of drinking in with the golfing, or shall I say, 'goffing'. Definitely my kind of event! If I'm ever in Australia, I'd love to participate. Who's the hottie behind Ted Knight? That would be my niece, Lacey Underall. She's in from Manhattan for the summer. you are more than welcome, & since it is an invitational, I personally invite anyone who wishes to participate, be it player, caddy, marshall, scorer, to come up/down to Australia,(the world spins you know)the next TKM is in August 2010 & it is the 25th Silver anniversary, be the ball. Bobby Sandford President TKM. still going on & still going strong, still waiting for one of our American cousins to join us, the 27th TKM is on December 29th, details on the website, & I'll bet you a $1000 bucks you slice into the woods..Bobby. Still saving up for the plane ticket...keep it going, one of these years I'll be down under for it.